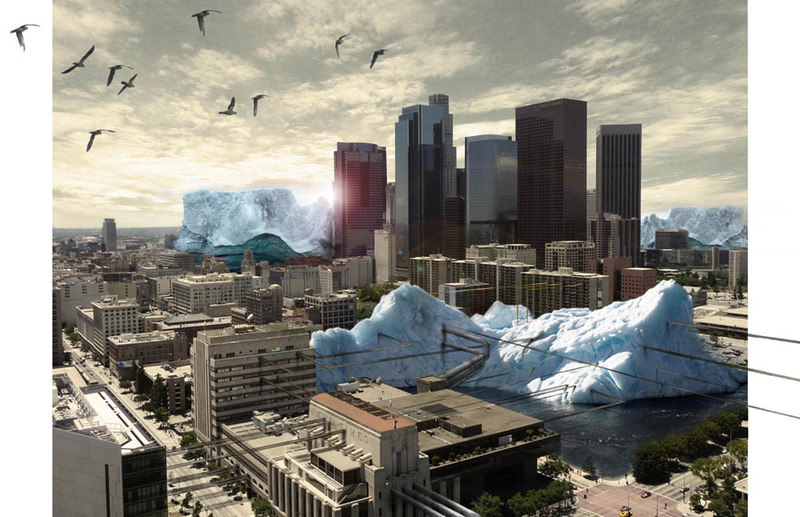 [Image: "L.A. Ice" by Victor Hadjikyriacou, produced for Unit 11 at the Bartlett School of Architecture, part of last year's Landscape Futures Super-Workshop]. The city of Ulan Bator, Mongolia, will attempt to keep itself cool over the summer by way of a kind of artificial glacier. According to the Guardian, this "geoengineering trial" will try to "'store' freezing winter temperatures in a giant block of ice that will help to cool and water the city as it slowly melts during the summer." Project directors "hope the process will reduce energy demand from air conditioners and regulate drinking water and irrigation supplies." 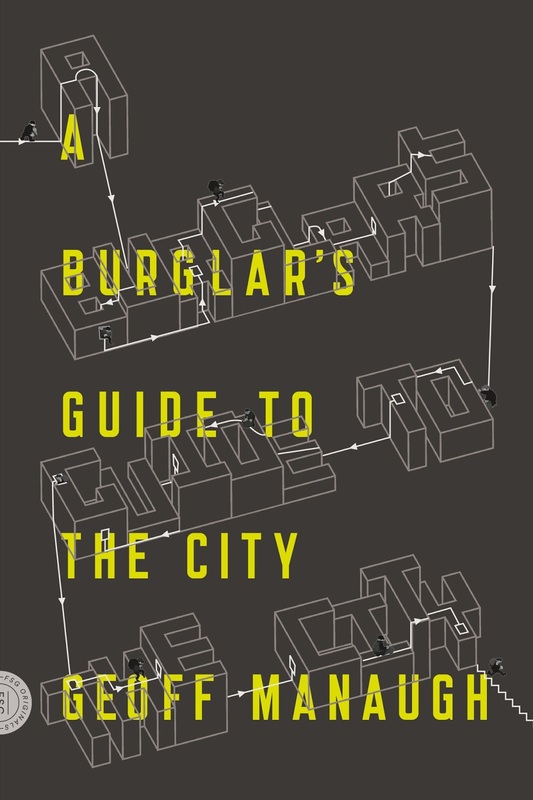 The cool air will presumably be pumped through the city via a continuous and monumental network of ducts. The project aims to artificially create "naleds"—ultra-thick slabs of ice that occur naturally in far northern climes when rivers or springs push through cracks in the surface to seep outwards during the day and then add an extra layer of ice during the night. Unlike regular ice formation on lakes—which only gets to a metre in thickness before it insulates the water below—naleds continue expanding for as long as there is enough water pressure to penetrate the surface. Many are more than seven metres thick, which means they melt much later than regular ice. Fascinatingly, naleds have already been used as foundations for infrastructural projects elsewhere; in North Korea, for instance, the Guardian reports, the military has utilized naleds "to build river crossings for tanks during the winter and Russia has used them as drilling platforms." The ideal site has the following characteristics: deep, narrow, slow flow in a single straight channel with gradual approaches to the ice; no tributary streams, creeks or lakes immediately upstream; and it is located near an existing road network. The site should also be free of warm springs and sand bars and not subject to major snow drifting. Being downstream of riffles/rapids may be conducive to supercooling and frazil ice formation that might accelerate ic e formation and growth at the bridge site. (...) Once natural ice cover has progressed across the channel thick enough to bear the weight of personnel and light equipment, existing snow cover is removed to accelerate ice growth at the bottom of the ice sheet. Variation exists in whether snow is removed or just compacted. Snow removal is recommended on upstream and downstream sides of the road for a distance of 23-30 meters (75-100 feet) as well as on the road itself. Subsequent to ice growth in response to snow removal, surface flooding is recommended to build up ice thickness on the road surface. (...) Lateral barriers of snow, logs or boards are used to contain floodwater on the road surface. Water should be applied by layering, allowing full freezing of previous water applications before the next. Conflicting recommendations exist as to whether brush or logs should be incorporated into the ice. One study did document the increase in ice strength after incorporating geo-grid material during the ice buildup process. A regular regime of ice drilling and monitoring of ice thickness is recommended. If you want something a little more hi-tech, on the other hand, the U.S. Army Cold Regions Test Center has slowly been amassing insight into the construction of ice roads and ice bridges. 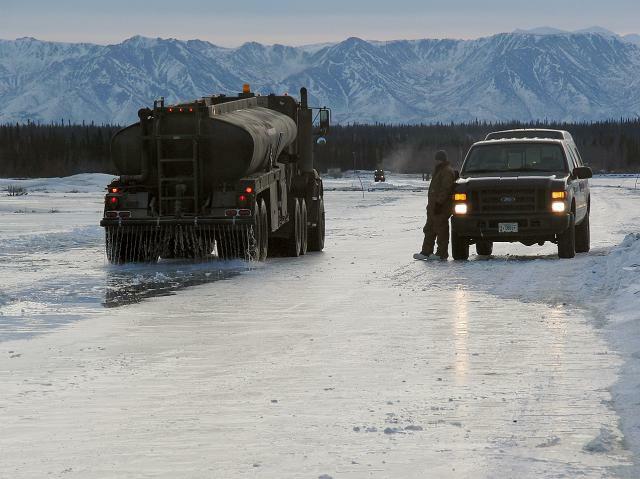 [Image: "A water truck passes over the ice road spreading a thin layer of water to thicken the ice so it can support heavy equipment transport"; photo courtesy of the U.S. Army]. "Building an ice bridge/road takes a lot of time, hard work and favorable weather conditions," the Army reports. "The water must be frozen down to the riverbed, which requires breaking the ice down to the bottom and allowing it to freeze from the bottom up. The Engineers had to pump thousands of gallons of water onto the bridge/road to get the ice thick enough to support heavy equipment, while at the same time smoothing it out so vehicles could drive across it easily." The engineers involved in this particular story "established an ice bridge/road that was 28 inches thick in the beginning of January. With work scheduled to continue through the end of February, the engineers will add another 2.5 inches of ice every day." And, as it happens, these experimental ice bridges grown by military personnel in the Arctic, like something out of Norse mythology, are a regular occurrence every winter. 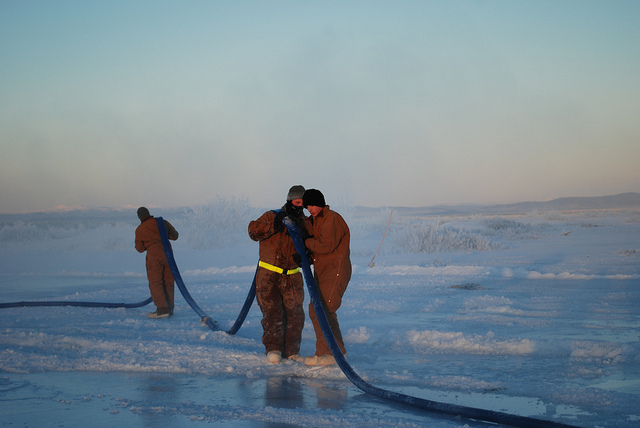 [Image: "Soldiers from the 6th Engineer Battalion, Fort Richardson, Alaska, clear water lines during construction of an ice bridge at the U.S. Army Cold Regions Test Center at Fort Greely, Alaska, Jan. 12, 2011." Photo by Sgt. Trish McMurphy, U.S. Army Alaska Public Affairs Office]. The engineers built field-expedient water tanks, berms of snow and crushed ice, to keep the water in designated areas for freezing. They move about 70,000 gallons of water per day using a gas-powered water pump and water lines. Once the bridge is capable of holding the weight, they will use 5,000 gallon water trucks to help speed up the process by delivering water faster than the pump. 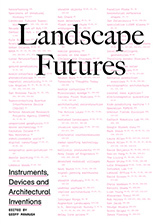 The frames and techniques used for building with frozen water, then, are very similar to those used when dealing with concrete; in either case, it is the architecture of hardened liquids. All told, the resulting ice bridge "will [be] slightly longer than a mile. It will be 24 inches thick and 75 feet wide. The bridge will grow and expand naturally with the weather changes, requiring some personnel to stay longer to maintain it." There are custodians of artificial ice forms and instant cities built from snow at the top of the world. In any case, the massive ice block used to cool Ulan Bator—I almost forgot what this post is about—will presumably undergo the initial stages of sculpting and augmentation quite soon, as the true cold of winter sets in; we'll have to wait till next summer to see if it's successful. 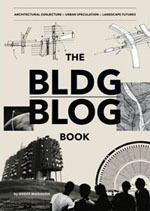 (Earlier on BLDGBLOG: Artificial Glaciers 101). Wondering about the energy required to complete and maintain these projects. This reminds me of Ian McDonald's "River of Gods," wherein one of the Indian city-states moves an iceberg to the mouth of the Ganges in an effort to provoke a monsoon. 1. Make a big plastic bag the size of a small pond. 2. Inflate it by raising a flimsy internal structure like a ship in a bottle. 3. Seal the bag and remove the structure. 4. Let the snow fall on it to weigh it down and pressurize the bag. 5. Before the snow melts in the spring, cover it with reflective mylar to keep the snow from melting so much. 6. Use the pressure in the bag to pump the melting water to refrigeration units or power turbines. Eventually the bag will deflate, and in the summer you re-inflate it. Or you could just leave it there if the ice hasn't melted, and let the snow hit it again. There must be a use for a big chunk of ice that doesn't completely melt in the summer... I think that's called a glacier, right? Mines have been doing this for a long time. In the winter water is sprayed into a mined out stope that has intake air passing through. Heat is passed from the water to the air, warming up the air (which is necessary in the winter) and freezing the water. In the summer the ice cools the intake air acting like an air conditioner.